Hi everyone! Ok, before I go any further, I’ll admit it. I haven’t been blogging every day. But still, I’ve done better than any time in the past year, so that has to count for something, right? And oh yeah, remember this is my first and only draft. I’ve published without even previewing…what you’re reading here is exactly how it came out of my head! #Lrncht: When is Training NOT the answer? In #lrncht (a weekly twitter chat every Thursday) we were discussing performance support vs formal training. Click here if you want to read the transcript of the chat. 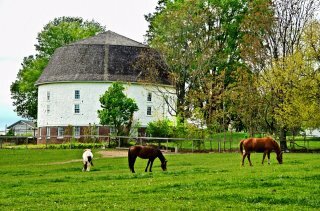 Pic Jimmy took during our conversation called "Round Barn and Horses, Urbana IL". As I was saying, Jimmy and I were driving through the cornfields of Central Illinois and I was trying to explain to him the difference between performance support materials and a formal class. And that’s when he had an epiphany. Yes, he described it perfectly. That is performance support. Training materials on hand in the moment of need to support his performance. So why doesn’t it exist? I immediately went into a litany of excuses. You know what they are, I can guarantee you’ve said at least one of these at some point in your career: The programmers/techie people hadn’t provided that information to the training team. No one had documented at any point, so the trainers couldn’t. The job aid does exist, just probably on an intranet, or in an LMS, or on a shared drive somewhere. The people who knew what the acronyms mean are no longer with the company. The IT department won’t let any documents be linked to the system (too expensive, too complicated, security issues, etc.). The training department wants to keep all the training materials in one location so as to not have multiple versions to update. Well, who would own any updates to the document – training, IT, vendor, etc.? You know how it goes, but the end result is that these are just excuses. How is any of that my problem? I just want to fill in the form. Why can’t anyone help me? So I ask you the same question: Why don’t you fight the fights to help your learners? Why don’t you help them? This entry was posted in 2012 Daily Learning Blog and tagged learning, Performance support, Technology, training. Bookmark the permalink.